In Canada, approximately 77 percent of employees are enrolled in traditional group benefits, with set coverage for all eligible team members. That coverage varies widely: perhaps team members have great extended dental, but need to pay for most of their eye care independently. That’s good news for anyone with Austin Powersesque oral hygiene, of course, but visually-impaired team members might prefer to have their glasses covered or to get some help paying for corrective eye surgery. Enter the flex plan for employee group benefits, which 64 percent of employees surveyed said they’d prefer. A flex plan allows team members to select the benefits most useful to them. They can opt to purchase more expensive, robust plans, or sign up for the most basic coverage. Within these plans, team members allocate credits to the coverage options they need most—whether that’s prescription medication, chronic illness care, or accidental death and dismemberment (AD&D) insurance. Since each individual owns the design of their benefits and goes through the process of selecting coverage, this makes it more likely that employees will actually use their benefits. Unfortunately, flex plans can be difficult to administer or communicate to the team—not to mention, they can be costly. Extra administrative expenses usually lead to higher premiums, and you’ll need to make sure that team members don’t move back and forth between plans. That’s why these days, the better option might be modular flex plans. As with traditional options, modular flex plans offer set coverage for certain benefits, like life, AD&D, or disability insurance. But there is also a degree of flexibility available: team members can choose different coverage options in a few categories, or use extra credits for something like a health care spending account (HSA). With HSAs, team members receive a bank of funds that they can use for expenses approved by the Canada Revenue Agency—anything from gluten-free foods and air filters to eye surgery and cancer treatments. HSAs are easy to administer and offer wiggle room when it comes to unforeseen expenses. Since most of us lack a fully functioning crystal ball, that flexibility can come in handy when unforeseen health care expenses arise. If you really want to be forward-thinking, perhaps you should consider supplementing your plan with a lifestyle spending account (LSA). Team members can use these funds for almost anything, from fitness equipment or daycare costs to a cooking class or camping excursion. Talk about total freedom! It’s unconventional benefits like these that the industry is veering towards. By taking note of these gradual patterns, you will ensure your company and team are well positioned for future success. Let your company lead the way in the people and culture revolution! For more insights on employee benefits plans and strategies, download our ebook on How to Attract Top Talent with Unbeatable Employee Benefits. 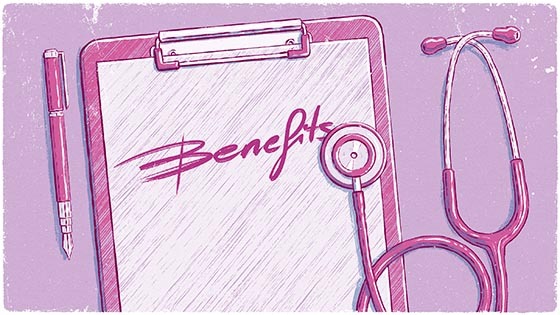 We discuss a few ways to help your team members understand their employees benefits plan and coverage.